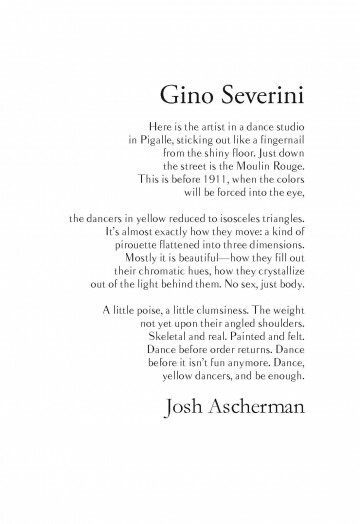 Josh Ascherman is an undergraduate student at Harvard College, where he studies English and where he is a member of the Harvard College Poetry Society. This poem represents his first publication! The dancers are not the only source of movement here. The poem itself moves from a view of the painter, to his painting, then on to his subject. The typeface had to convey the same sense of movement in its letterforms while remaining regular, like dancers moving through first position to second and so on, their spines as straight as the down-stroke on a capital T. Balham’s contrast between thick and thin is gradual, graceful in its transitions and without serifs; the typeface appears to be up on its toes. Garamond is similarly rounded in its bowls and connectors but has its seriffed feet flat on the floor to begin and end the scene. All of the text is right justified for a slightly altered perspective: the shape of a pirouette instead of the pirouette itself.